On Nov 14, Pete Brock joined senior football players from North Attleboro High School as they prepared for their big Thanksgiving Day game against long time rival Attleboro High School. Pete’s speech was motivational, educational, and powerful. The football players went on to the field the next day, with Pete’s words still in mind, and won the game! 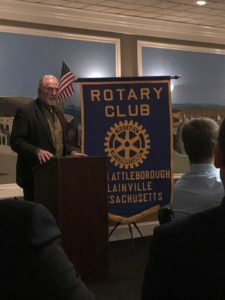 The North Attleboro Plainville Rotary Club hosted the dinner for the football players and coaches at Luciano’s Restaurant in Wrentham, MA.